Super Erecta/Super Erecta Super Adjustable: Super Erecta and Super Adjustable shelves are available in a variety of widths and lengths. Improved Organization and Inventory Control: Top-Track allows better organization of stored goods and permits improved inventory control with one-stop delivery and pick-up. Increased Productivity: With reduced square footage dedicated to storage, Top-Track maximizes the amount of productive “front of the house” space available, increasing daily revenues. 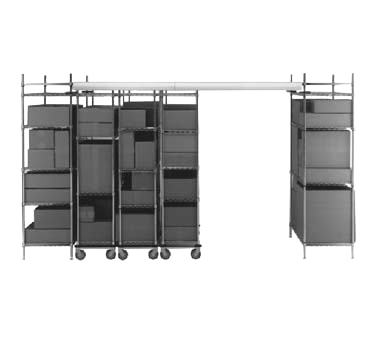 Accessible: The overhead track system guides the mobile units and opens an access aisle between any two units, whenever it is needed. The open access promotes cleanliness and easy access for walking or for utility carts, simplifying the material handling task.